Posted by Holly Baker on October 31, 2018 in Lifestyles. As Halloween draws to a close, the Latin American holiday of Día de los Muertos takes center stage. Celebrated Thursday, Nov. 1, to Friday, Nov. 2, Día de los Muertos, or Day of the Dead, is dedicated to honoring loved ones who have passed away. The first day is dedicated to the children who have died, while the second day is dedicated to lost loved ones of any age, according to nationalgeographic.org. “During this celebration, people pray while having pictures of their loved ones on an altar, along with many flowers and with each of the dead one’s favorite food. The food is seen as a offering to the spirit,” Ferris business administration sophomore Lezley Rodriguez said. While mourning a loved one is the typical response to remember- ing the dead, nationalgeographic. org states that for Día de los Muertos, participants are required to celebrate the deceased with food, drinks and parties. Any mourning or sadness would be insulting to the holiday and what it represents. “I know that where I’m from in Mexico, everyone does go to the graveyard and visit their loved ones with tremendous amounts of flowers and music. During this day the graveyard is filled with people. You can look at this as being kind of like Memorial Day here in the United States,” Rodriguez said. Normally, the dead are thought of as dead, but during Día de los Muertos, the dead are awakened from their sleep and celebrating with their loved ones. “Children during this day also may ask for ‘candy’ like Halloween here in the United States. Instead of children saying ‘trick or treat,’ they say ‘el muerto, el muerto,’ meaning ‘the dead, the dead’ in English. But instead of handing out candy, people hand the children small portions of food such as maybe a piece of bread, Jell-O, cake, et cetera,” Rodriguez said. The holiday is not widely celebrated in the U.S., but there are some areas where people can be found celebrating their loved ones. 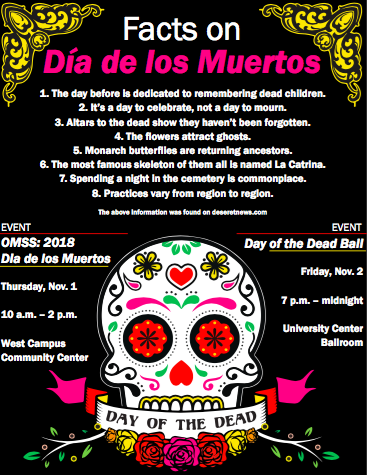 In celebration of Día de los Muertos, the Office of Multicultural Student Services (OMSS), Ferris Spanish Department and Spanish Club will be hosting OMSS: 2018 Día de los Muertos 10 a.m. – 2 p.m. Thursday, Nov. 1, at the West Campus Community Center. Sigma Lambda Beta Int. Fraternity, Inc., co-sponsored by the African Student Union and the Hispanic Student Organization, will also be hosting a Day of the Dead Ball from 7 p.m. – midnight Friday, Nov. 2, at the University Center Ballroom. “Although we don’t celebrate the holiday big like in Mexico, we still acknowledge our loved ones who have passed on Nov. 2, which is the day of Día de los Muertos. I think it’s a great way to remember the ones who have passed and bring the community together to celebrate such a wonderful day,” Rodriguez said. For more information on both events, visit calendar.ferris.edu.